This book is a solution manual of the 110 questions that were presented in the eight chapters throughout the author’s previous book, Optimal Control Engineering with MATLAB. The manual is prepared as an independent book since it includes the problems’ questions, figures, and all necessary equations and formulas in a summarizing fashion and within the given solution frameworks. The idea behind writing this book is to increase significantly the student’s or reader’s knowledge about the optimal control discipline that is found in many engineering fields. 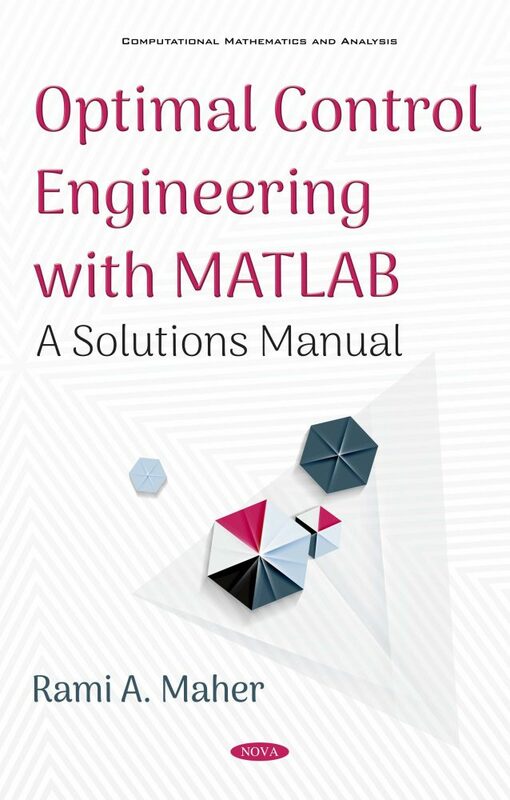 Detailed step-by-step hand solutions are carried out while utilizing the MATLAB functions in the toolboxes. Simulink models are presented to simulate and validate the obtained results. Each chapter concludes with the lists of MATLAB programs that are used either to assess or to develop the desired solutions to challenging problems. The reader will discover the importance of using these programs, especially in solving parameter optimization design, different nonlinear TBVP, finite horizon LRQ, DDP and ILRQ problems. In addition, the implementation of the obtained time function optimal control law by a transfer function controller is accomplished for some problems. Among these problems, the reader will find many practical engineering problems in continuous as well as discrete forms. Finally, the reader can easily modify these programs and Simulink models for his or her problems. Hans P. Geering, “Optimal Control with Engineering Application,” Springer-Verlag Berlin Heidelberg 2007. K. Ogata, “Modern Control Engineering,” Tata McGraw-Hill 1997. Roland S. Burns, “Advanced Control Engineering,” Butterworth Heineman 2001. Maxwell Norton, “Modern Control Engineering,” Pergamon Press Inc. 1972. Fan, L.T., E. S. Lee, and L. E. Erickson, Proc. of the Mid-Am. States Univ. Assoc. Conf. on Modern Optimization Techniques and their Application in Engineering Design, Part I, Kansas State University, Manhattan, Kansas (Dec. 19-22,1966). Benoit C. CHACHUAT, “Nonlinear and Dynamic Optimization- from Theory to Practice,” Automatic Control Laboratory EPFL Switzerland 2007. Forray, M. J., “Variational Calculus in Science and Engineering,” McGraw-Hill Book Company, New York 1968. Kirk, Donald E., “Optimal Control Theory: An Introduction,” Dover Publications, Inc., New York 1970, 1998. Noton A. R. M., “Introduction to Varaitional Methods in Control Engineering,” Pergamon Press Oxford 1965. Yasundo Takahashi, “Dynamic and Control Systems,” Addison-Wesley Pub Co, 1970. H. Maurer, N. P. Osmoloviskii, “Second order optimality conditions for bang-bang control problems,” Control and Cybernetics, Vol. 32, No. 3, 2003. Jacobson, D. H. and Lele, M. M. “A Transformation Technique for Optimal Control Problems with State Variable Inequality Constraints,” IEEE Trans., Automatic Control, AC-14, No. 5, October 1969. F. L. Lewis, “Optimal Control,” New York, John Wiley and Sons 1986. D. Jacobson and D. Mayne, “Differential Dynamic programming,” Elsevier Publication Company, New York, 1970. Stanislaw H. Zak, “Systems and Control,” Oxford University Press, Inc. 2003. Weiwei Li and Emanuel Todorov, “Iterative Linear-quadratic Regulator Design for Nonlinear Biological Movement Systems,” 1st International Conference on Informatics in Control, Automation and Robotics, August 2004. L. Spiral, V. Ovsjannikov, “Optimization of Industrial Control Systems,” in Czech language, SNTL/ALFA 1982. J. R. Koza, “Genetic Programming: On the Programming of Computers by Means of Natural Selection,” Cambridge MA: The MIT press, 1992. J. R. Koza, “Survey of Genetic Algorithms and Genetic Programming,” Proceedings on 1995 WESCON, Piscata way, NJ: IEEE 7-9 Nov. 1995, Pages 589-594. Mohamed J. Mohamed, “A Proposed Genetic Programming Applied to Controller Design and System Identification,” Ph.D. thesis, University of Technology, Baghdad, February 2007.